Every couple of months the AMFI Statement Store changes its interior and collections. 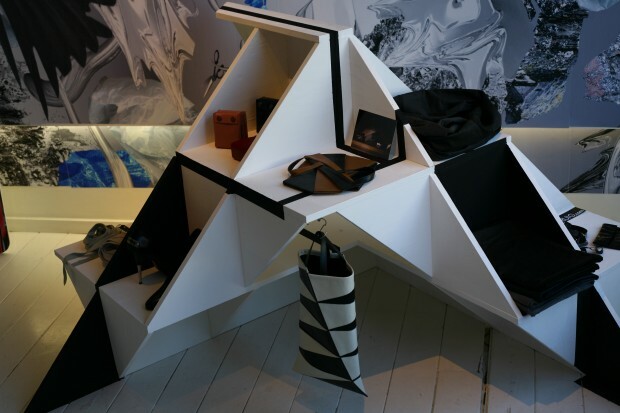 The store is a project from the Amsterdam Fashion Institute and is designed and managed by its students. The last couple of times it has been really sweet and feminine but this time the fashionistas are going a little bit more ‘street’. The new design is more masculine, geometric, edgy and features credit cards.. Well trust me, when you see the new clothing in store you will need one! Alumni of the Sandberg Institute, the master course of the Rietveld Academy, made the graphic design that shapes the current interior (they operate under the name Pinar & Viola). As I said, a big part of the interior is determined by the so-called ‘credit cards’, which are huge cards with a design on it. They each reflect a part of our civilization, such as the credit crunch. You really have to take a second look to see the subjects in them though. Maybe that’s a good thing though, because the credit crunch is the last thing you want to be thinking about when you see the new collection. The statement store (or, for the next six months, ‘THE STORE By AMFI’) always features clothing by Amsterdam Fashion Institute students, alumni, and friends. The collection features anything from multicoloured scarves to a lovely tweed-like jacket, which I really had to restrain myself with. There were also some leather knotted dresses as well as necklace with a big moustache. And in case you haven’t seen our pictures from the photo booth at the Cassette Collectief x Overdose.am party, we love us some impressive upper-lip coverage. Even though I really liked the previous lay-outs, the new interior is something new for the Statement Store. Men will probably be less intimidated the new, darker, design. I sure hope so for them, because guys, chances are your girlfriend will drag you inside in the next few weeks. But don’t worry, you won’t be disappointed.